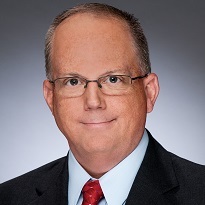 W. Draper, Senior Director of Airport Operations for the Greater Orlando Aviation Authority is responsible for the overall management of the daily airport operations at the Orlando International Airport and Orlando Executive Airport. Airport Operations consists of the following divisions: Landside, Airfield, Airline, Baggage Handling/Ground Support Equipment, Parking, Ground Transportation Services, Noise Abatement, Emergency Management, Aircraft Rescue & Fire Fighting, and General Aviation. As part of his duties he is charged with the oversight of planning, development, promoting, and implementation of programs for the Airport Operations Department as well as responsible for this group’s annual operating and revenue budget. He is also responsible for many areas of emergency preparedness and management for Orlando International Airport. Draper has been with the Greater Orlando Aviation Authority for over twenty-seven years, starting as a Firefighter/Paramedic. He moved through the ranks of the Fire Department, served in the Airport’s Maintenance Department then Airport Operations managing the Airport’s Emergency Management Program, Landside and Ground Transportation Services Divisions before serving as Director and now Senior Director. Draper currently holds an A.S. Degree in Emergency Medical Services and a B.S. Degree in Management. He also is accredited by the Federal Emergency Management Agency as a Master Exercise Practitioner, MEP. Airport.